The scale and stupidity of the Central Intelligence Agency’s lies presented in the 9/11 Commission Report are seemingly bottomless and so I have re-drafted this report to focus on the most glaring deceptions. Ramzi bin-al-Shibh, the Yemeni born "key facilitator for the September 11 attacks"
This next section of the 9/11 Commission Report, shown below, really does beggar belief. It asserts that within a few months of having a random conversation on a train in Germany, they had been introduced to Osama bin-Laden and Mohammed Atef, al Qaeda’s two most senior commanders. It also asserts that from a global organisation that'd been established for 10-years, al Qaeda chose four new and “aspiring jihadists” to execute the greatest terrorist attack in history, based principally on their “familiarity with life in the West”. The commission goes on to claim that the four 'aspiring jihadis’ were sent for ‘special forces training’ before being given bundles of cash and told to return to Germany to commence with their assigned mission. Again according to the 9/11 commission, the three Hamburg Cell members who were able to gain visas travelled to the US on their suicide mission within six-months of first joining al Qaeda in December 1999. The 9/11 plot was instigated on the 26th September 1997, the morning after my dinner conversations with Yousef. An initial feasability study was immediately assigned to future Hamburg Cell leader Mohammed Atta. This was done via the Yemeni Hamburg Cell member Ramzi bin-al-Shibh. The connection between my meetings in September 1997 and the Hamburg Cell is my dinner companion Youssef. 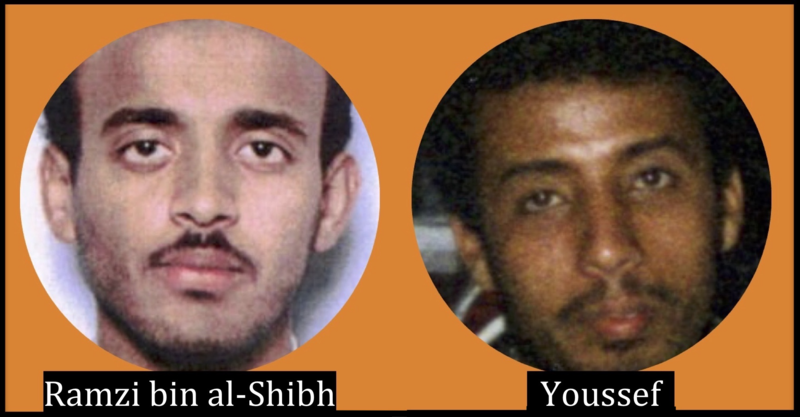 From facial recognition software matches, nationalities and the circumstances of our meeting I have determined Youssef and Ramzi bin-al-Shibh are either brothers or cousins. First Ramzi bin-al-Shibh returns to Germany after a visit to Yemen, sometime in late 1997, settling in Hamburg (Page 161). About the same time cell leader Mohamed Atta appears to either attempt one last reconciliation with those he is think of attacking (Western civilians), or is simply researching and preparing himself for the proposed attacks (Page 160). Possibly most compellingly, Ziad Jarrah switches studies from dentistry in Greifswald (in northeastern Germany) to aircraft engineering in Hamburg (Page 163). Establishing the date of this course change request would be very 'interesting’. From the historycommons website we can see the first hijacker visa applications connected to the 9/11 plot are made just 5-weeks after my meeting with Youssef in Yemen. Historycommons reports that Mohamed Atta & Ramzi bi-al-Shibh ‘disappear’ from Germany for some months in late 1997. I would suggest they both visited the same training camp near al Qaidah town in Yemen that I visited in September 1997. Lastly from historycommons, this report that says within months of when I think the 9/11 plot was instigated by me in Yemen, a former CIA agent is told by one of the most valid sources possible exactly what was going on. A Qatari Prince & former head of Qatar's police force telles Robert Baer that “KSM is going to hijack some planes”. Former agent Baer passes this warning back to the CIA but recalls “there was no interest”. I gave my last and most specific warning of the impending attacks when I was in New York in December 1997; clearly that and other warnings I gave were ignored. I’ve read about so many other warnings given by people far more qualified than myself being ignored too. And so I find it incredible that the CIA appears to have got away with their assertion that the Hamburg Cell had no connection to 9/11 until 1999, when a man on a train decided to speak to them, because “they were Arabs with beards”. I pray every day that justice will be served to those responsible for the previous and current investigatory commission’s shameless coverups of who is really most guilty for planning the murder of 2,976 people on 9/11. I also hope justice is served to those who are most responsible for not stopping the attacks before they happened. 9/11 was 100% preventable and I know people CHOOSE not to stop it, mostly for their own profit.